Microsoft were pretty unsuccessful with their new Windows RT operating system and their Surface RT. Nobody knows the exact numbers yet, but we suspect they are less than what Ballmer and the team expected when they released both products. With this poor start to the hardware side of Microsoft, they will be hoping that the Surface Pro, the top-tier tablet, will do better. Some lucky viewers at CES got an inside look at the new tablet. 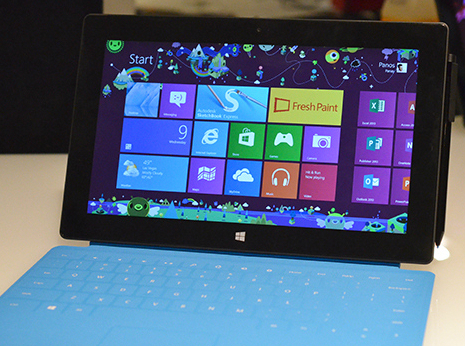 The Surface Pro has a 10.6-inch ClearType Full HD Display outputting a 1920 x 1080 resolution. This is one of the best displays on a ten inch Windows 8 tablet, text looks crisp and colours are vibrant. Surface Pro has been designed to look very similar to the Surface RT, but inside the device the Pro really shows its power against the RT version. Intel Core i5 runs this tablet and it does an incredible job at it, with 4GB’s of RAM for push power. Surface Pro comes with all the accessories the previous one did, apart from the pen that is included. The stylus is thin and works well on Windows apps. This device weighs a little more than the Surface RT and it is a little fatter, but you cannot feel the difference. Microsoft’s main problem was applications and we have seen over the course of a few months thousands of app developers flock to the new Windows Store. The other problem was Windows RT was a lacklustre tablet OS and had little to offer against the Surface Pro with full Windows 8. Surface Pro should be coming to markets soon and we suspect that Microsoft will ditch the effort with Windows RT for now. We suspect a hefty price tag for the tablet that can run PC apps, anywhere between $999 – 1599, depending on if Microsoft offer different Intel Core processors and storage options.